"What's your accomplice's name?" he repeated. And, although the question "What accomplice?" was logical, it earned the woman another slap; a brusque, precise slap on the same cheek as the first, as if Castro were fitting his hand to the pre-drawn contour. Mariona Sobrerroca is blonde, voluptuous, and dead. Frantically searching amongst papers, desk drawers and book shelves, the man finds what he is looking for and runs from the room. When it comes to it, Prosecutor Grau and Commissioner Goyanes argue briefly over who should be lead detective on the Sobrerroca case; the widow found dead in her husband's ransacked office in Tibidabo, beaten and strangled. The gruesome rumour of an eyeball on the floor was just that – a rumour; her husband had been a society doctor and the eyeball came from an anatomical model dislodged during the struggle. Grau takes the unusual step of ordering high-profile press coverage for the case, an exclusive for La Vanguardia. Too notorious a murder to be censored out of existence, this will kill two birds with one stone: keeping the press in line whilst satisfying the well connected amongst Barcelona's bourgeoisie that the police are doing their job. Ana Marti, society reporter for La Vanguardia, answers the phone call from her editor. He is not looking for an obituary. Instead, he wants Ana to write about the murder investigation. She will liaise with the police and work alongside one of Barcelona's most effective detectives, Isidro Castro. Meanwhile Beatriz Noguer, a professor currently barred from teaching, sits in her book-filled apartment listening to her maid who has learned the gruesome details of the Sobrerroca murder from the chicken man, but the academic in Beatriz is just as fascinated by her maid's accent and dialect as by the gossip. For Inspector Castro, the prospect of a woman journalist looking over his shoulder throughout the investigation is the last thing he needs. His mood is dark as he lays out the details of the case for Ana Marti. Don't bother writing notes, señorita, we'll give it all to you in writing. Moliner's award-winning crime novel THE WHISPERING CITY places two women, a young journalist and her politically disgraced older cousin, at the heart of a murder story set in Franco regime Barcelona. Unconvinced by the police investigation's conclusion and unable to control their curiosity, they allow a bundle of letters to lead them into dangerous territory. Murder, secrets and corruption darken further with the difficulty of knowing whom to trust when their own lives become endangered. Sara Moliner is the pseudonym of writing duo Rosa Ribas and Sabine Hoffman. Ribas is Spanish and lives and teaches in Frankfurt, Hoffman is a former philology lecturer at Frankfurt University. This is their first foray into crime fiction together and it takes a while for the plot to focus and pick up pace but once it does so it moves briskly. This restrained start gives the writers time to build up a convincing picture of Barcelona’s contemporary mores, manners and political claustrophobia but I remained uninvolved with the characters until well into the book. There is always a question mark over translation when reading books originally written in another language. I would think this novel raises a particular challenge as many of its plot subtleties rest on Beatriz and her passion for Spanish literature, language, dialect and structure. 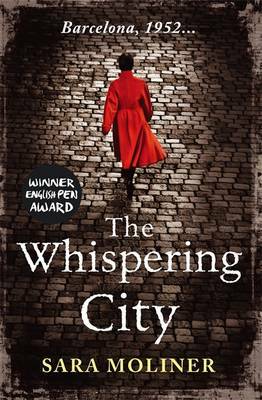 However, by the end of THE WHISPERING CITY I had a fondness for Beatriz and Ana and can safely say that this is a story that will appeal strongly to lovers of historical-political crime fiction.